Convenient apartments in Upper Darby and Drexel Hill, Delaware County, PA.
Merion Trace is an apartment community designed to insure the utmost in privacy and convenience for our residents. People choose Merion Trace for the same reason we chose the location=CONVENIENCE! Only three short blocks to the SEPTA's 69th Street Terminal which can transport you to virtually every part of the city and surrounding suburban communities. Plus shopping, restaurants, movies, concerts and public golf courses are only minutes away. For our residents' convenience we have provided off-street parking. 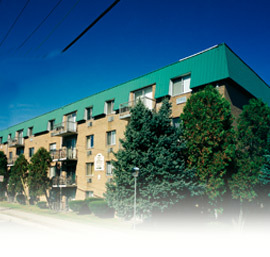 Add to this our continual interior and exterior maintenance programs and you get the best in apartment living! Laundry facilities in each building. From 69th Street Terminal: Exit terminal on West Chester Pike (Route 3), heading west. Proceed 2 blocks and turn right on Merion Terrace. At "A" Building turn right into the parking lot, and go to Building D. From 476 take Route 3 exit (Upper Darby/Broomall). Follow Route 3 East approximately five miles. Cross over State Rd. and get into far left lane (2/10 mile down on left after State Rd.) and turn left onto Merion Terrace. © All rights reserved. The McKee Group.